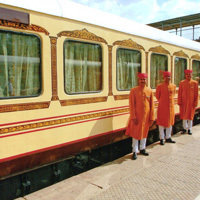 With World class amenities, exquisitely designed interiors, gastronomic dining and vibrant on board ambience, the Maharajas Express journey is invariably filled with romance, adventure and style. Here you will travel through some of the most scenic landscapes, most alluring cities and enjoy an array of images – tigers, snake charmers, mountains, jungles, deserts, forts, palaces, dances, and sumptuous cuisines. 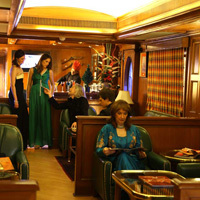 Day 1: Mumbai Today you will board the Maharaja Express in Mumbai, enjoying a warm welcome before proceeding onto Ajanta. Dinner and overnight stay on board. Day 2: Ajanta Caves After breakfast, you will embark on an excursion to Ajanta Caves. The rock-cut caves date back to 2nd century B.C. and contain Hindu, Buddhist and Jain sculpted art. Dinner and overnight stay on board the train. Day 3: Udaipur This morning you will arrive into Udaipur. Visit the City Palace complex and Crystal Gallery. Experience traditional hospitality over lunch at an exclusive venue. After lunch, you will have the option of choosing to go on a walking tour across the old bazaar, or visit the vintage car collection of the royal family or take delight in the Son-et-Lumiere program at City Palace. Day 4: Jodhpur A ride through the countryside will bring you to Jodhpur. Take a walking tour of the Old Clock Tower Market and continue to the majestic Mehrangarh Fort. Enjoy an optional visit to a local village, home to the Bishnoi tribe (additional cost). Later, return to the train for dinner and overnight on board. Day 5: Bikaner Today you will arrive at the desert kingdom of Bikaner. Here you will have a choice of optional excursions (additional cost) – Deshnok (Rat Temple), Lalgarh Palace Museum, or a camel breeding Farm or shop for KundanJewellery. In the afternoon you will visit the fortress of Junagarh. Afterwards, take part in a camel-cart procession followed by sundowner cocktails, barbecue and a folk performance on the sand dunes. Day 6: Jaipur The Pink City of Jaipur welcomes you with an exhibition elephant polo match and a champagne lunch at an exclusive venue. Thereafter, you will proceed to visit the Amber Fort followed by free time for optional activities – a choice between shopping, time at a spa, a game of golf or a visit to the City Palace. Day 7: Ranthambore – FatehpurSikri Today you will embark on an exciting game drive into the Ranthambore National Park – one of the biggest and most renowned national parks in Northern India. Continue the journey to see the fascinating royal court complex of FatehpurSikri. Day 8: Agra – Delhi Disembark in Agra – Proceed for an early morning visit to the exquisite TajMahal followed by a champagne breakfast. Afterwards, continue on to Delhi, which will mark the end of your tour.